It’s Throwback Thursday! Which means Postmodern Jukebox’s newest video was released today. 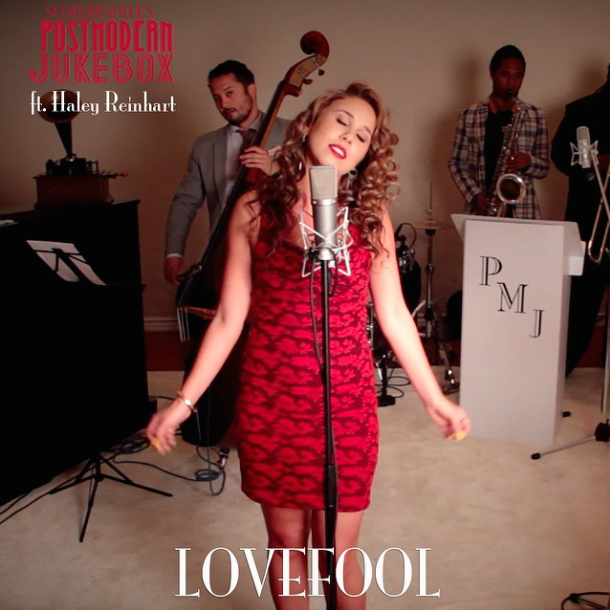 This is Haley’s 3rd solo cover with PMJ so far. “Lovefool” by The Cardigans was their song choice this time around. You might not remember which song it is by the title, but everyone’s heard it at least once in their lifetime. Scott Bradlee and Haley took this 1990’s hit and transformed it into a 1940’s Frank Sinatra-esque jazz classic. Haley’s first show with PMJ on their North American Tour is tonight in Nashville, Tennessee! See all her tour dates by clicking the “Tour” tab above. I don’t think it matters what song Haley sings; she sounds so incredible singing it – and looks good doing it 😀 I loved her on AI when she did the jazzy songs and I am sooooo glad that PMJ has given her a platform for that type of expression! Thank you, Scott, for giving her the opportunity! My fav AI song was “I Who Have Nothing” …. any chance of doing that song with PMJ?